Each lung is made up of 2 or 3 sections called lobes. A lobectomy is the surgical removal of one of these sections from the lung. Take antibiotics or other medications. Shower the night before the procedure with a special soap. Traditional thoracotomy—A large incision will be made. The ribs will be spread. The lung lobe will be located and removed. Video-assisted thoracic procedure—Several small incisions will be made between your ribs. A tiny camera and special tools will be inserted through the incisions. The inside of your chest will be viewed on a nearby monitor. The lung lobe will be located and removed. If you are having a lobectomy to remove cancer, the lymph glands in your chest will also be removed. The glands will be tested for any sign of cancer. After completing the procedure, tubes will be placed in your chest. They will help drain the chest cavity. The incision(s) will be closed with stitches or staples. You will be taken to a recovery room. You will be given fluids and medications through an IV. You will be asked to cough and walk often. You may be given an incentive spirometer. This is a breathing exercise device that will encourage you to take deep breaths. The chest tube will be removed before you go home. You will have to limit specific activities, but daily walks may be encouraged. Follow your doctor's instructions. Information for patients undergoing a thorascopic wedge/lobectomy. University of Michigan Department of Surgery website. Available at: http://surgery.med.umich.edu/thoracic/patient/discharge%5Ffollowup/teaching/tscope%5Flobe.shtml. Updated April 3, 2012. Accessed March 6, 2018. Lobectomy. Johns Hopkins Medicine website. Available at: http://www.hopkinsmedicine.org/healthlibrary/test%5Fprocedures/pulmonary/lobectomy%5F92,P07749. Accessed March 6, 2018. Management of resectable non-small cell lung cancer. EBSCO DynaMed Plus website. Available at: http://www.dynamed.com/topics/dmp~AN~T906057/Management-of-resectable-non-small-cell-lung-cancer. Updated February 14, 2018. Accessed March 6, 2018. 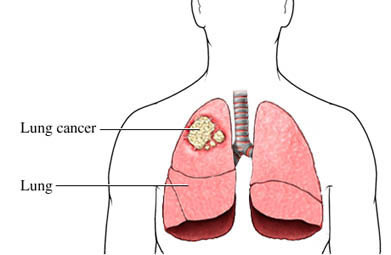 Small cell lung cancer. EBSCO DynaMed Plus website. Available at: http://www.dynamed.com/topics/dmp~AN~T115654/Small-cell-lung-cancer. Updated October 27, 2017. Accessed March 6, 2018. Surgery for Non-Small Cell Lung Cancer. American Cancer Society website. Available at: https://www.cancer.org/cancer/non-small-cell-lung-cancer/treating/surgery.html. Updated February 8, 2016. Accessed March 6, 2018. 6/3/2011 DynaMed's Systematic Literature Surveillance http://www.dynamed.com/topics/dmp~AN~T905141/Treatment-for-tobacco-use: Mills E, Eyawo O, Lockhart I, Kelly S, Wu P, Ebbert JO. Smoking cessation reduces postoperative complications: a systematic review and meta-analysis. Am J Med. 2011;124(2):144-154.